I know that St. Pat’s has past and gone, but I discovered this most delicious and easy recipe that I honestly think can be used any time of the year. It is delicious the next day toasted and topped with honey, jam or whipped cream cheese. It uses half the usual amount of flour called for in most soda bread recipes and therefore is on the lighter side and I believe is the reason that it keeps better. I hope that you’ll enjoy it as much as I have. In a medium large bowl, mix all the dry ingredients. I use a whisk to do this. 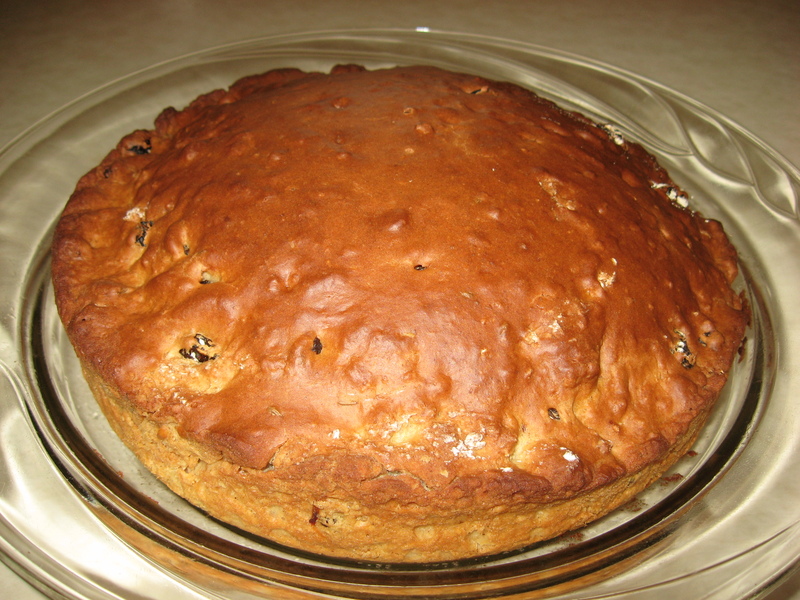 When well mixed add the raisins or currents. In a small bowl whisk the buttermilk, eggs and vanilla till well blended. Make a well in the middle of the dry ingredients; add the liquid ingredients and mix quickly till blended and no more flour is showing. Pour into the cake pan and bake for 45 to 50 minutes. Mine was done in 45 minutes. Place pan on a rack and let sit 10 minutes before removing the bread. * If you don’t have buttermilk, do this: take 1 ¼ C. milk minus 1 ½ Tblsp. and briefly heat the milk in the microwave—about 1 minute. Then add 1 ½ Tblsp. white vinegar and let it sit while you prep the rest of the ingredients.